A flash of nostalgia – Raistlin Majere is one of my all time favourite characters from fantasy literature and is obviously my inspiration for the Legend of Raistlin. I remember reading Dragonlance where he is one of the main characters, many years ago, it was one of the first fantasy novels I ever read. I played a lot of Advanced Dungeons and Dragons back then, that’s where I started to paint miniatures at first, they were gaming pieces for that. 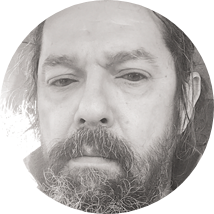 I also got a lot of inspiration from the paintings of Larry Elmore, he informed a lot of the aesthetics of Dungeons and Dragons in that period, the late eighties and early nineties. 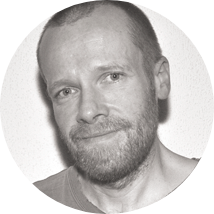 He has made a lot of iconic paintings for the book covers and especially for Dragonlance. 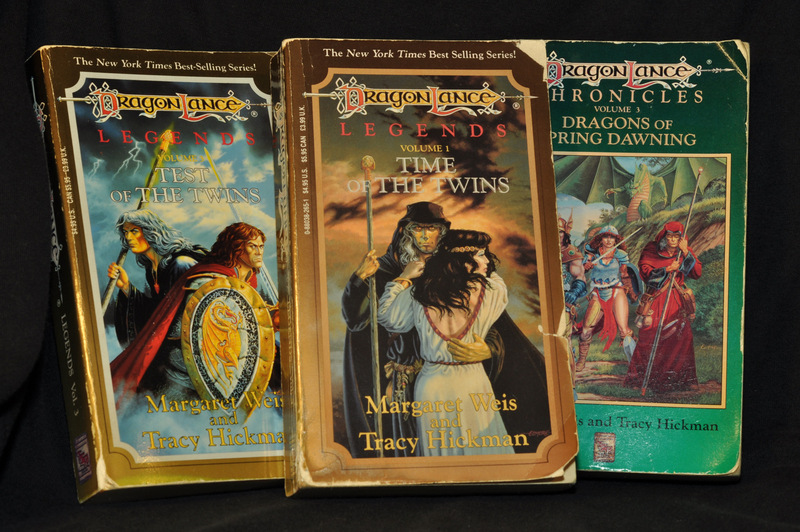 A lot of stand-alone pieces of art as well, he really defined the looks of the Dragonlance gaming universe. 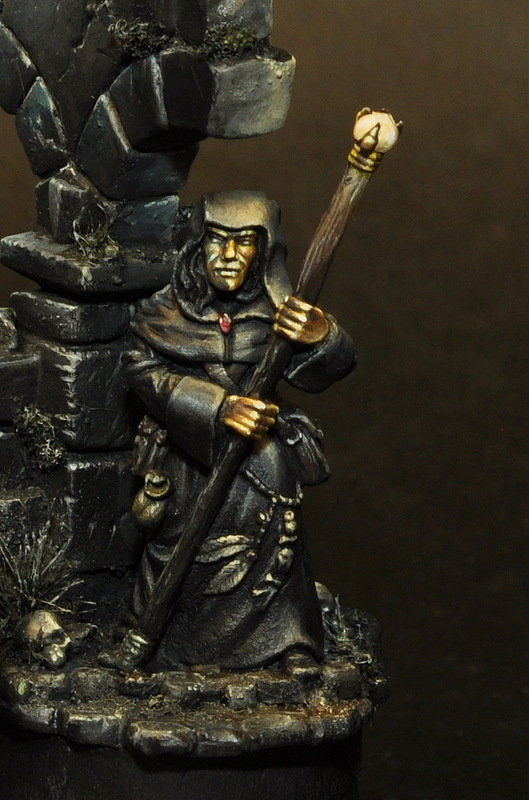 I found this old unpainted 28mm Raistlin figure, from Ral Partha, I had lying in my stash, since back in the day when I played myself and got all nostalgic. Even though Legend of Raistlin is based on a novel cover, where he wears the red robe of the neutral, I am going to tweak him a little. I shall depict Raistlin at the height of his power, wearing the black robes of evil. He stands in the Shoikan Grove, which is a place of immense evil and darkness; a grove of old oak trees, that are infected with ghosts and the undead, the grove itself emits fear, scaring everybody away from it and if somebody should in any way overcome their fear and get into the grove anyway, they would be set upon by the ghosts. This serves as the defence of the tower of high Sorcery in Palanthas. There were several of these towers, but this one has a special curse of old. Only the master of the past and the present can penetrate the Shoikan Grove and enter the tower. I shall depict Raistlin in the darkness of the Shoikan Grove. Lit up only by the light of his staff and a little bit of faint cold moonlight, standing in front of the gate to the tower grounds themselves. Just about done building the vignette. I sculpted the bloodstone on his chest, that which he used to steal Fistandantilus’ soul, to become the Master of the past and present. The vignette came together quite fast and easily. 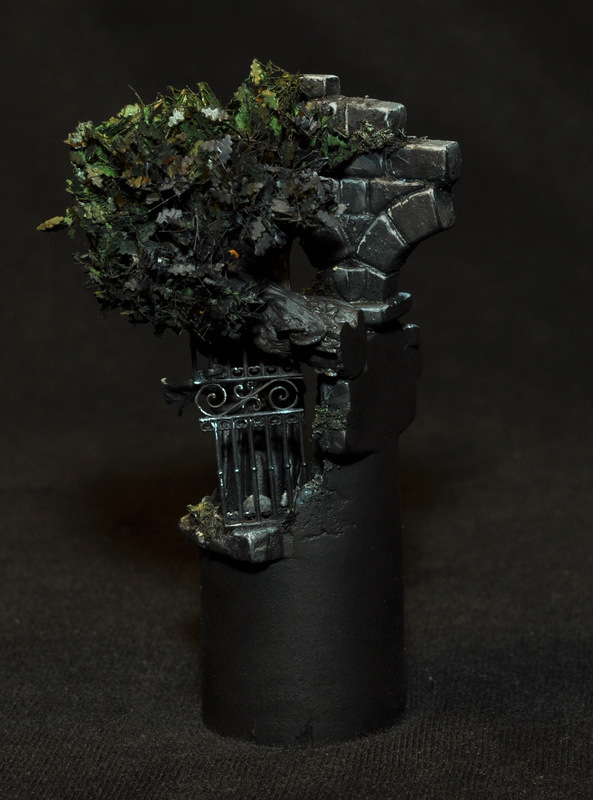 I sculpted a little tree to lean in over the wall and left a couple of skulls and bones on the ground. 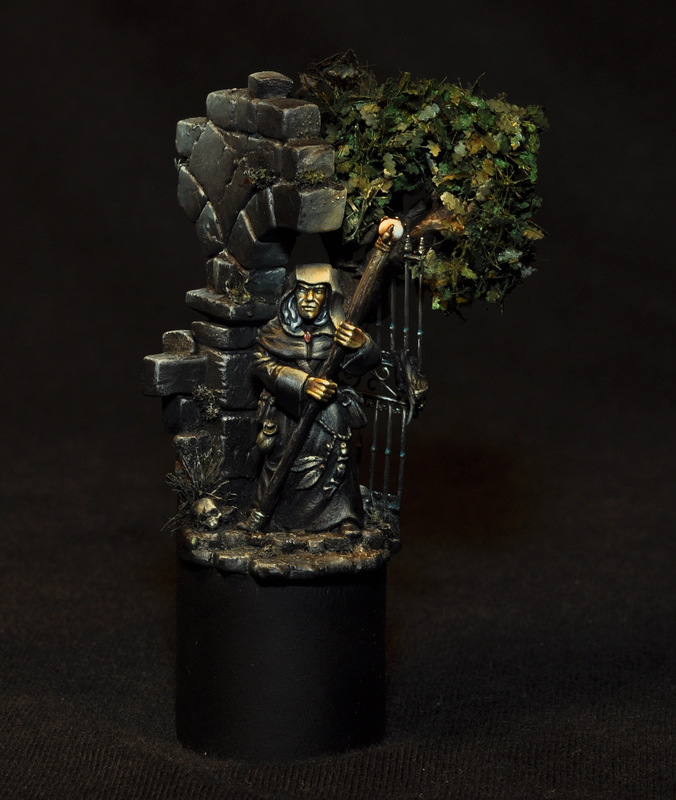 The tree is placed cleverly behind Raistlin to reflect the light of his staff and provide a background. I mostly build up the groundwork and backgrounds to my miniatures in the beginning to get as coherent a result as possible. I left the tree and fence/gate in the background unglued, so I could remove them for easier access with my paintbrush. There was a challenge in this for me; the foliage of the tree; I had to wait until the end of the paint job before I glued leaves to the tree, so I had to constantly remind myself that there would be more colour and density in the background in the end. The stone wall is mostly made of plastic bits, I scored the surface a little and smeared a bit of my ground material in the recesses to make it look suitably old, rough and dirty. Basecoated and ready to go. 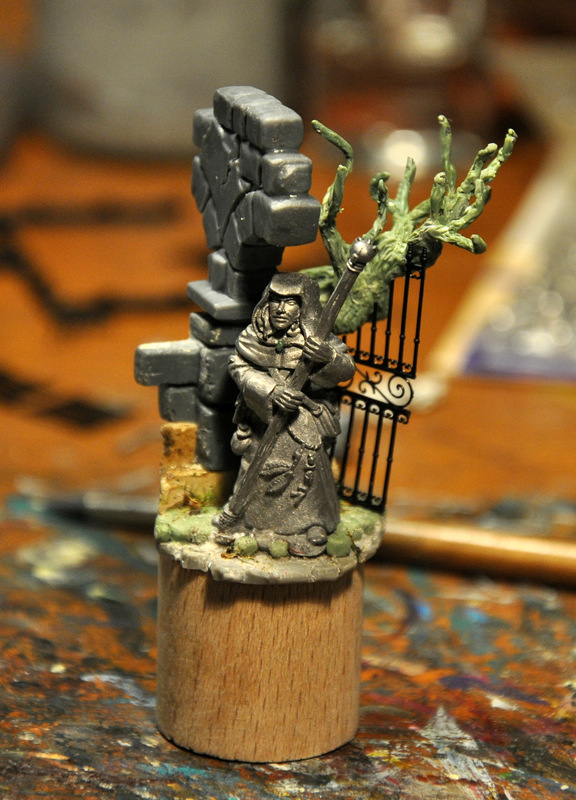 I sculpted a bit of cloth fluttering from the wrought bronze gate in the background. That was one of the powerful, evil black-robed wizards of old, he hurled himself from the top of the tower and screamed a curse upon the tower as he fell. He got impaled on the wrought bronze gate down below. His mortal remains are long gone after about 300 years, except maybe for a few bones left on the ground and a shred of his robes ensnared on the gate, fluttering in the wind to this day. It was his curse that turned the Shoikan Grove into such a terrible and ugly place. The tower of high Sorcery used to be the most beautiful building in the City of Palanthas, but after the curse it turned black and now looks like a skeletal finger pointing accusingly at the sky. According to the curse, the tower would remain locked until the Master of the past and present would return in power. To begin with I gave it all a black undercoat and just a tiny blast of the white spray. Just enough to define details and provide roughness in the surface for the paint to grip on, it is after all a night scene. I started by making a quick sketch of the basic light situation. I used some Vallejo Model Color black in which I mixed a little Schmincke Prussian Blue. You can use any dark blue you like, but this one is my favourite. I gradually mixed in P3 Menoth White base to illustrate all the light from the staff. Menoth White Base is a creamy warm slightly yellowish bone colour, much like the old Bleached bone from GW, I love it and it is a very versatile colour for warm highlights. I wanted the light from the staff to have a warm, slightly golden tone, so I chose Menoth White base for everything that was lit up by the staff. I mentioned earlier how I love and feel inspired by Elmore’s artwork for AD&D and especially Dragonlance. Many of his paintings have a sort of golden warmth to them, I wanted to capture a little of that on my paint job of Raistlin. This golden light would hit roughly one half of his body, one side of the wall, one side of the tree and one side of the fence in the background. I intensified the light sketch by adding more and more Menoth White Base to my mix as I got nearer to the light source; the crystal on top of the staff. The top and side of Raistlin’s hood and the outermost stone of the arch above his head got in the end pure Menoth White Base. The opposite side of my vignette would get a faint moonlight, here I mixed in a little Titanium White. Titanium White is an intense cold white and therefore perfect for moonlight and very high reflections. I made the moonlight much less intense than the source light from the staff, I let the light come in from the left, so I got the opposite direction from the staff. In that way I avoided a conflict between the light sources, the moonlight would only serve as a bit of a compliment to the warm light and provide definition to the areas that would not get the warm light from the staff. The cobblestones on the ground and the stonewall got a mix of GW Charadon Granite (You can use whatever grey/brown mix you like) and black. Then these were highlighted by adding Menoth White Base towards the crystal top of the staff and a little titanium white in the opposite direction. The small clumps of moss here and there on the wall and ground got a little Vallejo Air Medium Olive when they were close to the light source and I mixed in a lot of my Prussian Blue when I got away from the light of the staff. Again highlights of Menoth White Base towards the staff and Titanium White when turned to the moonlight. There were areas here and there, especially on the wall, that were in complete shadow or even backlit, these I painted pure black. 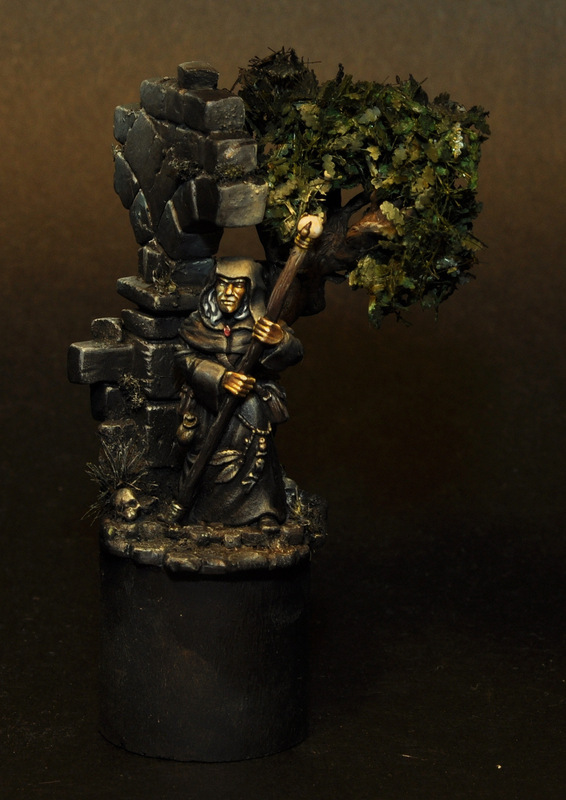 The tree in the background got a little Vallejo Model Color Burnt Umber where it turned to the light, that was highlighted with first GW XV-88 and you guessed it: Menoth White Base where the branches got closest to the crystal atop Raistlin’s staff. The fence in the background was first painted Vallejo Model Color Black Brown on the front and highlighted with thin lines of Menoth White Base, it is supposed to be bronze. The staff got a little P3 Umbral Umber, with Menoth White Base mixed in towards the top and a little black and blue towards the bottom. A line of white mixed into it to highlight the upper side of the staff and Menoth White Base on the crystal top. 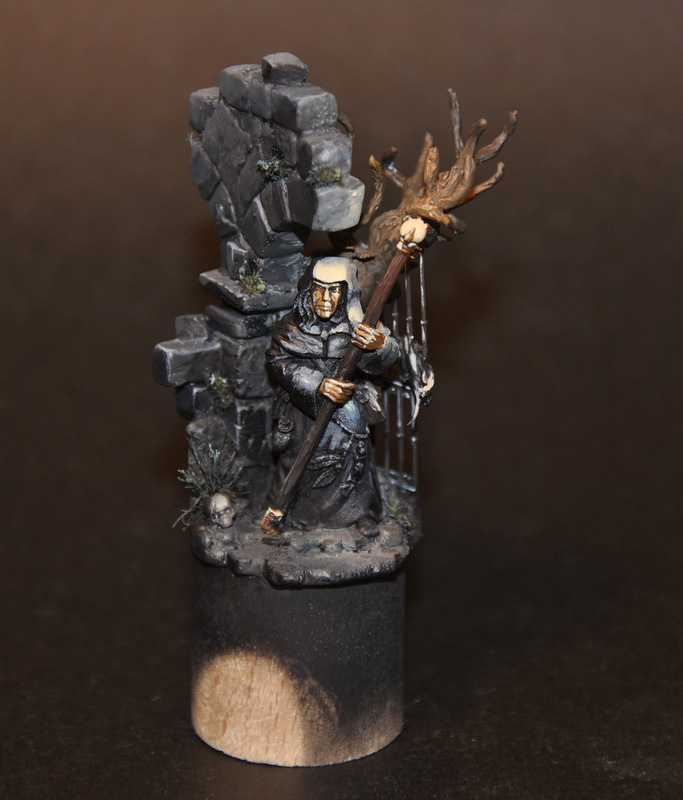 I went for a NMM finish for Raistlin’s golden skin. I sketched that in as well, very basic, but it gave me the feeling for what everything would look like. The NMM sketch was just a block of GW XV-88, which is a light yellowish brown, a lot like the old Snakebite Leather, a good starting point for NMM gold. I you can use whatever yellowish light brown colour you like for this. 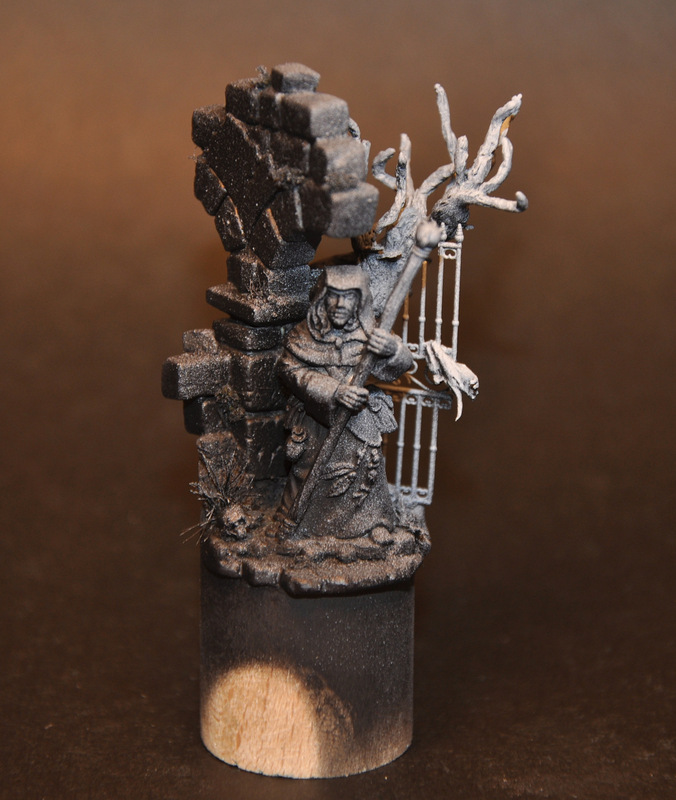 This got a wash of Strong Tone for shadows and just a quick lick of pure Menoth White Base where the metal would catch the most light and a little lick of it on the other side of his face where the moonlight would hit, thus creating rhythms of light, which help us to understand the metal surface. My choice of Menoth White Base for the highlights becomes apparent now, because it not only is a good colour for warm highlights, but it is also a good colour for highlighting NMM gold, so by using the same colour for two different functions and materials I get to tie my colour scheme together nicely, it creates colour harmony in my piece. This is a lot of words to describe 30 minutes of sketching -at most, but it goes to show the importance of this first stage. After such a sketch, your miniature should work at arm’s length and all you need now is to zoom in, refine the result and add details. So if something in your overall light composition is not working, you should paint it over and kind of zero in on what works and where to put your highlights. Everything is rough at this stage, but it is now that you inform what the finished result will look like. After half an hour of sketching it does not hurt to paint things over and correct mistakes, so now is the time to do that and save a lot of trouble later in the process. Working from a sketch like this, kind of programs your brain and hands to keep remembering and following the initial light situation and helps a lot to avoid doubts later on, about how to place highlights on the miniature. The highlights should be a bit exaggerated at this point, but don’t worry, there will be plenty of glazes to dial it down in a minute and it is not a problem to make adjustments during the paint process, so everything will fit in the end. Now that my figure works at arm’s length, it is time to start zooming in. Everything is to be refined now and made to work in closer. I often start with the base and all my figure’s surroundings, in that way I can make the world of the figure interact with the figure. It can also be the other way around, but this is more common. Bare in mind that the light from the staff of the figure is a huge interaction from the figure on to the background, so here it is as mostly something, that goes both ways. Anyway, I find it easier to make my figure fit in with the background than to make the background fit the figure. 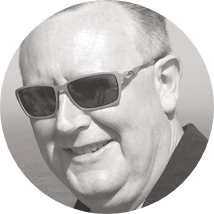 I started by blending in softer colour transitions on the wall and the cobblestones on the ground. In that process, I also corrected a few errors in the lighting, as for instance individual stones in the wall, that may have been a little too light instead of fading properly away from their respective light sources. After that initial refining, I glazed it to make everything more soft and subtle. First, I gave it a little Army Painter Strong Tone, to give it a little bit of an earthy feel. Then I glazed it with black, for this I use P3 black, because I have often experienced the Vallejo Model Colors to get a little flaky and inhomogeneous when diluted too much and I wanted my black glazes to go down as smoothly as possible. After the first couple of glazes, I started to reapply a few of the highlights, to create a little more focus and keep the contrast between light and dark going. 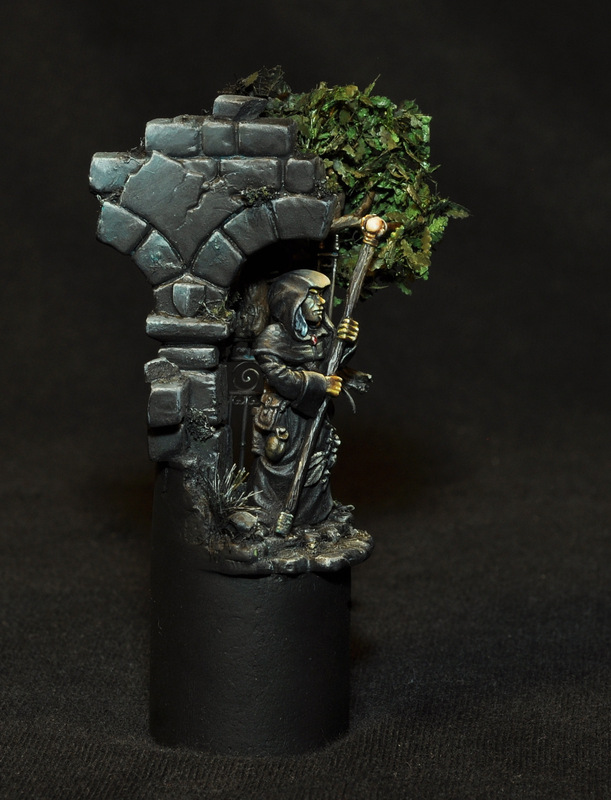 I introduced a little stone texture with GW Charadon Granite mixed with a little black, slapped on here and there on the larger stones in the wall, just random splotches and brush strokes to make some stone texture. At this point I also highlighted the edges of stones and plants. On these edges I made many of the highlights in small dots and lines to show the rough texture of the materials. After that a couple of more black glazes and a glaze of Prussian Blue as well in the moonlit areas. I highlighted the edges with a few more dots and lines. 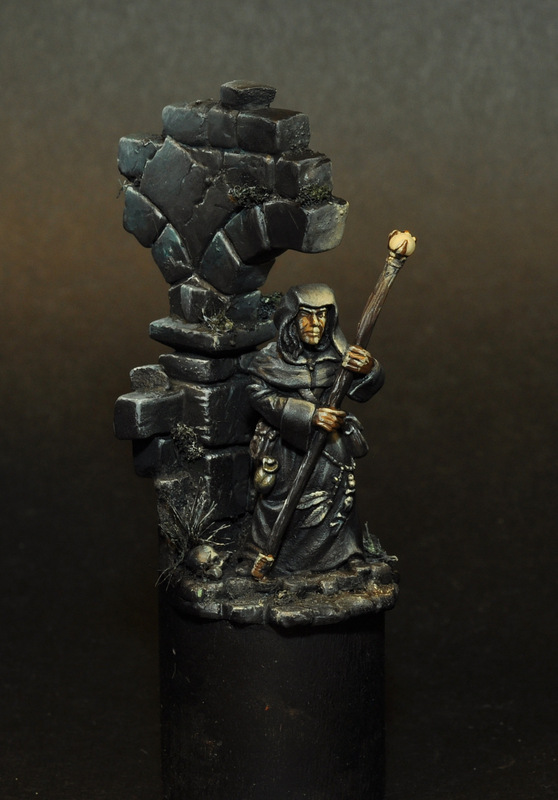 I dry brushed the cobblestones and dusty areas, then a bit of Strong Tone and a little more, black glaze. By going back and forth like this, I kept refining the base and background until I was satisfied. Now came the time to refine Raistlin in the same way. 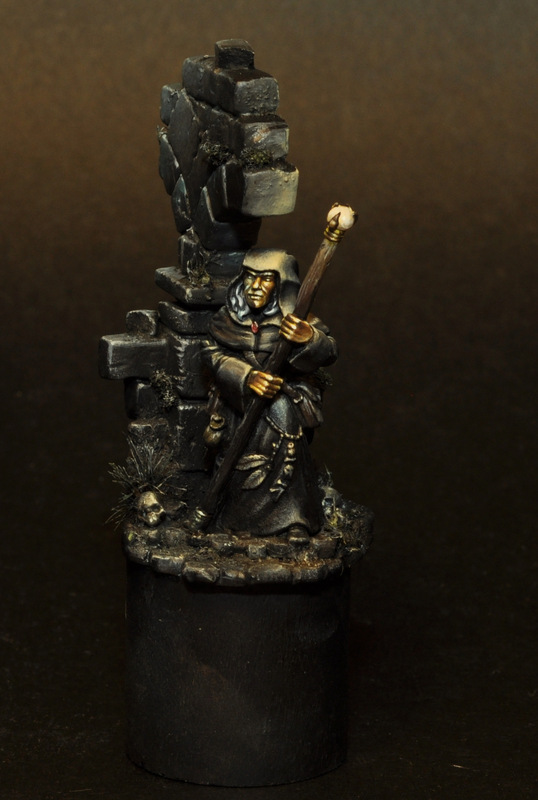 I started by softening and blending the lights on his black robe, using Menoth White Base in my mix in the areas that got hit by the light of the staff and adding titanium white sparingly to the mix where the moonlight would hit him. Do not be afraid to make some small brush strokes at this point, they will actually help to create a feeling of the cloth texture. 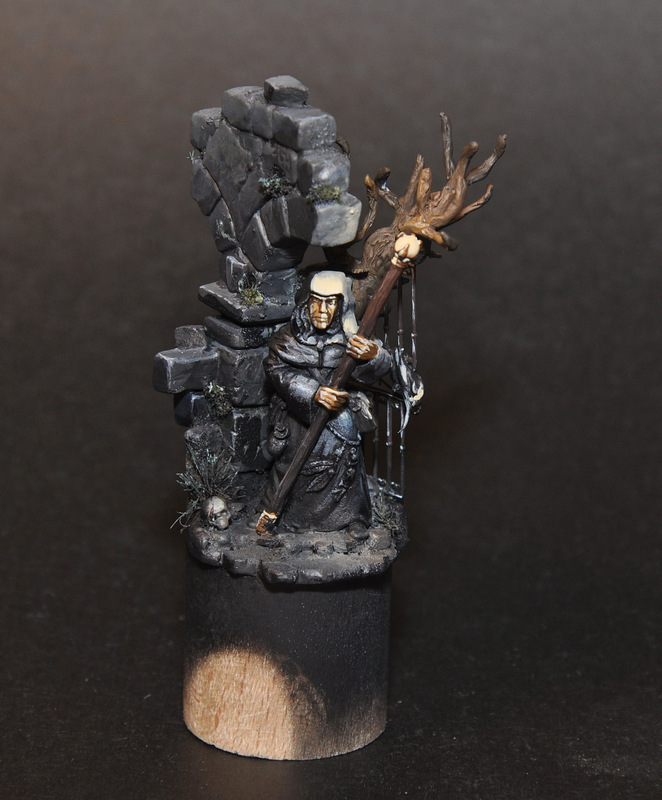 After the blending, I glazed his robes with black several times. Here and there I would paint shadows of pure black, both, to define the shadows in opposition to the light, but also because dark areas, that get a little light tend to get these sharp transitions to shadow. You see this in the deep folds of the robe and in the folds on the sleeves and the back of the hood. After that I highlighted a little again, this time more focused and added some edge highlights where appropriate and in the end a little more black glaze. Around this point I started to introduce a little turquoise to the palette. I added turquoise glazes in the areas that got the moonlight, both on the stonewall and the black robes of Raistlin. In that way, I made the moonlit areas colder, tied the main components of my little vignette together and created some points of interest with colour. It also helped convey a cold feeling of evil. Thinking ahead, this cold glaze in the moonlit areas would also contrast nicely with my warm highlights where the staff would light the scene up. I went a little back and forth on the robe pushing and refining the highlights and glazing in between until everything was nice and soft and dark. Note how I always kept the highlights on the hood and sleeves fairly sharp compared to the rest. Not only would they get most of the light from the top of the staff, but they would also help frame the face. The staff was already sketched out, it was a small matter to refine it with some Strong Tone, some more of the highlights it already had and a couple of black glazes and one of Prussian Blue. A few titanium white dots and lines on the upper side to make it shine a little in the moonlight, like old wood, worn smooth and shiny by constant handling over many years. The various pouches and bags with Raistlin’s spell components were painted in varying nuances of brown; GW XV-88, P3 Umbral Umber and Vallejo Model Color Burnt Umber. These had black and Prussian Blue mixed into them to keep it dark and harmonious. They were highlighted by adding Menoth White Base or Titanium White where appropriate and shaded with Strong Tone and finally a little black. Edges got small dots and lines of almost white, to turn it into well worn, shiny leather. He has a bit of string wrapped around carrying these feathers and bone amulets, it got the Burnt Umber and Menoth White Base as highlights. The bones and feathers hanging there were painted first with a mix of Menoth White Base and black, then highlighted with a little pure Menoth White Base, then shaded with a wash of Strong Tone and finally rehighlighted with pure Menoth White Base followed a mix of Titanium White and Menoth White Base. Once all that was dry I gave the whole figure a thin glaze of black to tie all the different elements a little more together. 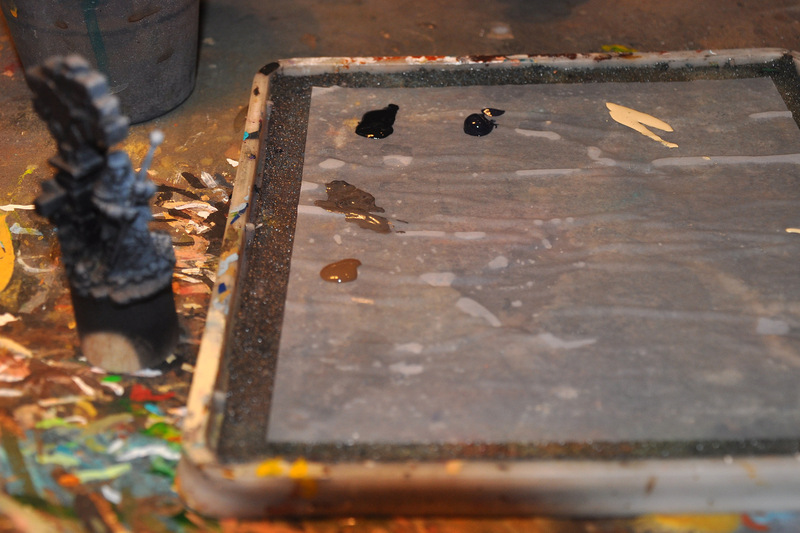 Small dots of pure Titanium White to make shiny points of direct reflection on all the bags and amulets. Upon my sketch on his face, hands and metal bits of the staff, I painted a mix of GW XV-88 and GW Caltharn Brown, to create a mid tone, leaving the lightest and darkest areas free of paint. Then I started highlighting with pure XV-88, thereby defining all the light areas. I mixed in a little Menoth White Base, thinned my paint a little and started pushing my highlights, gradually mixing in more Menoth White Base. Once I had a strong definition of highlights , I started shading it. At first I thinned down a little P3 Umbral Umber and floated it into the recesses. Then I used a little of the same paint to paint on a few dark reflections. I mixed in a little black and made even darker shadows and made sure that some of the dark reflections would border straight on the highlights, to create some of those sharp shifts between light and dark reflection, you only get on highly reflective surfaces such as metals. I highlighted with pure Menoth White Base. 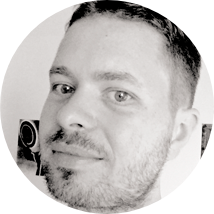 I made the last and deepest shadows with pure black, very sparingly! At this point I also made sure that Raistlin’s face was framed in black, to represent the hood of his black robe reflecting on his skin’s metal surface. I mixed a little Scale75 White Alchemy with Menoth White Base, just to give it a little bit of sparkle. On top of that I made tiny highlights of Titanium White; mostly little dots of direct reflection. I gave it all a thin yellow glaze to tie everything together. One side of Raistlin’s face is turned to the moonlight, I gave that a turquoise glaze, to make a cold blueish reflection. The bottom of the staff is far away from the light sources, I glazed it rather heavily with Prussian Blue, black and turquoise, so it would be a lot darker than everything else. To finish the metal surfaces, I reapplied the white dots of direct reflection. 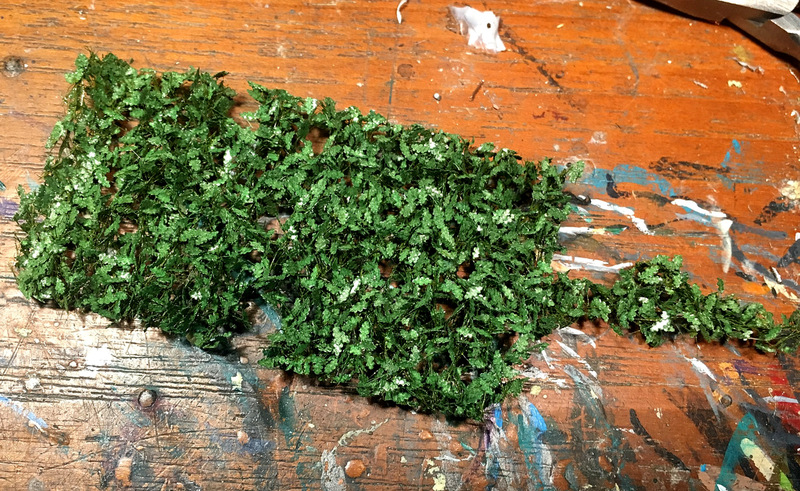 I glued clumps of Mininatur green oak leaves on my little tree. You have to be careful when you work with these, the leaves are a little bit adhesive themselves, so if you squeeze them they will stick together in hard dense clumps and that is not what you want. I cut off small clumps with a pair of scissors and carefully superglued them to my branches, building up the shape I want. If the clumps of leaves are a little loose, you just take a toothpick and gently smear some superglue on the side of a clump facing another and gently push them together as the glue sets. I dryfitted the tree to my base from time to time during this process, to make sure I made the foliage fit. I trimmed stray strands of fibre with my scissors and generally trimmed the whole treetop before moving on. 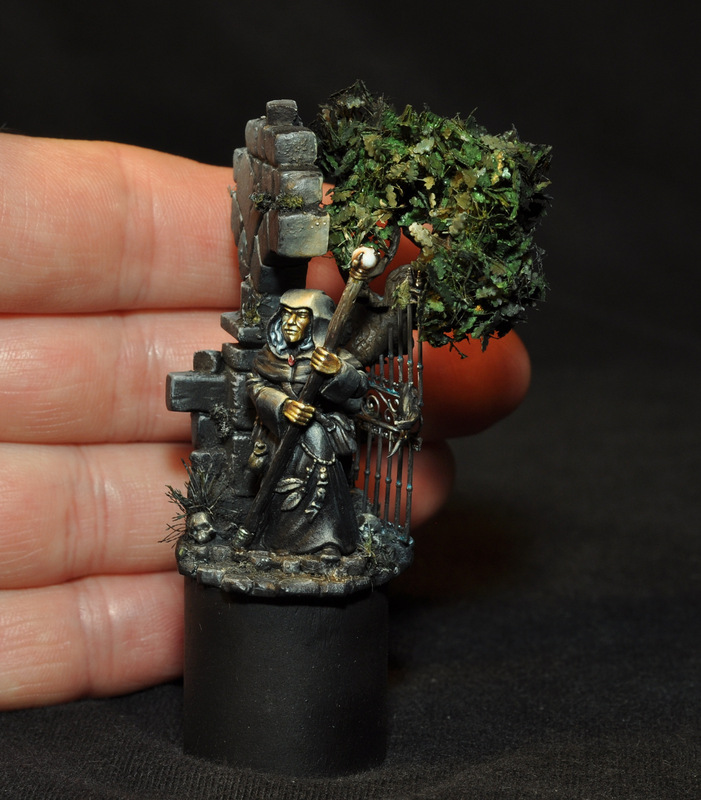 Once I was satisfied with my little tree it was time for a little paint on that as well. I took my airbrush, dialled the pressure down and loaded it with some thinned down black paint. You don’t have to dial it so far down that it spits, let it make a decent spray pattern, as gently as possible, too much pressure and you just blow the leaves off! I wanted the top of the staff to make a halo of light and the rest in shadow. So I carefully sprayed black on the shadow side of the tree. I dryfitted it several times to my base to get the transition right. I intensified the black paint the further away from the light I got. It is perfectly ok if you can see a few leaves and patches inside the foliage, that do not get the black paint, you don’t have to drown it in the black, those patches inside looks just like when you have surfaces turned to the light, that reflects inside the foliage, making everything come to life. Once I was satisfied with my shadow I made a thin mix of black, white and Prussian Blue and highlighted the leaves a little bit where they turned towards the moonlight. This I glazed with turquoise. Bear in mind that when we see colour, we see reflected light in different spectra depending on what pigment there is in a given surface, so the less light there is, the less colour we see. So here it should be warm and colourful where everything is lit up by our light source and grey, black and colourless where it is not. My turquoise glazes in the moonlit areas are a little bit of cheating to make a little interest in an otherwise colourless area and to communicate the cold feel of moonlight and starlight. Now onto the light of the staff, shining on my tree and Raistlin! When we look at Larry Elmore’s paintings, they often have a certain golden warmth to them, sometimes almost like the paint is old and faded, but in a good way, not yet desaturated, just real warm and nice. I wanted to capture that feeling here. I painted the leaves with Vallejo Model Air Medium Olive with brush. This is a thin paint, as it is made for airbrush, if you use another, make sure to thin it down properly, so you can apply it gently. After a first coat of pure Medium olive I mixed in my ever present Menoth White Base, making the colour gradually lighter towards the center and the staff; my light source, I dryfitted it from time to time, to make sure I placed these highlights right. The last bits and edges were pure Menoth White Base. At this point I painted the crystal top of the staff. First Menoth White Base, then with a little White Alchemy mixed in for sparkle, then I added Titanium White to the mix and in the end pure Titanium White. Now Raistlin’s hood and the parts of the stonewall, that got close to the light source got an extra highlight of Menoth White Base. Then it is going to get a tint of colour. I meant to use GW Seraphim Sepia, but I realised that I’d run out of that colour. I found an old half full pot of GW Gryphonne Sepia in a drawer, that would work just as well. 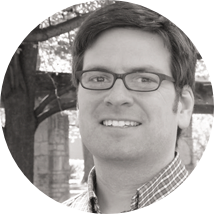 Sepia is an interesting light brown yellowish colour, a little like paper yellowed by the sun and age. This is the right colour to invoke the golden warmth of Elmore’s paintings. 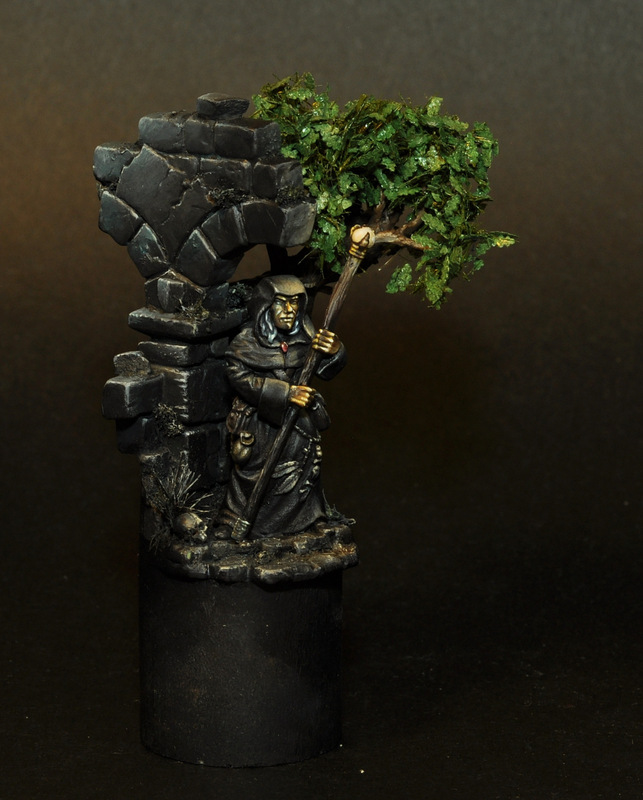 I glazed Raistlin and the stonewall with this sepia colour. All the areas that were lit up by the staff, the side of his head, the hands, the hood, his chest area, left shoulder, the sleeves. And, of course the stonewall arching over his head. Make sure this paint does not pool in the recesses, it tends to leave a grey mark if it builds up too much especially when the paint is old. I had a couple of accidents of this nature in some of the folds, I carefully painted them over with black. I watered down some of my sepia paint and airbrushed it on my tree in the light area. Now everything had this nice and warm glow in sharp contrast to the cold dark areas with only a little moonlight on them. I reapplied some white spots of direct reflection on Raistlin’s face, hands and the crystal top of the staff. I glued the tree on the top of the wall. 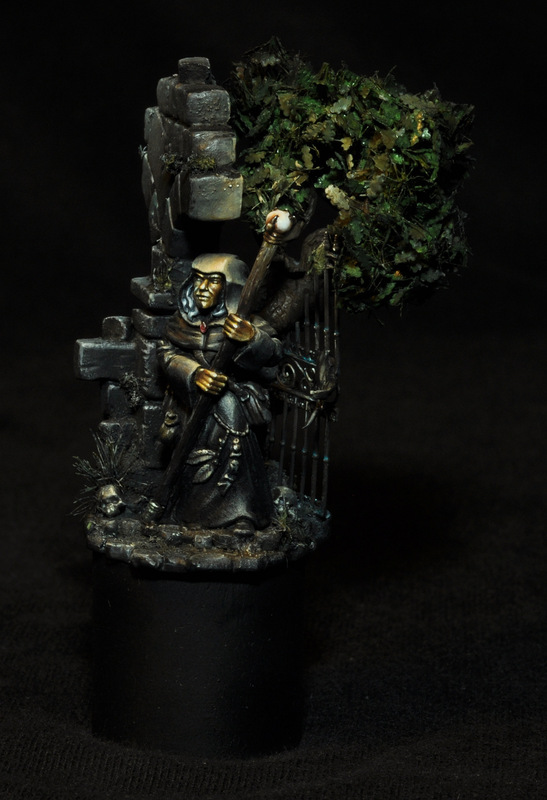 The wrought bronze gate in the background with the shred of cloth hanging from it, was painted black in the back and Vallejo Model Colour Black Brown in the front. Highlighted on the front with Menoth White Base and Titanium White in small stripes and dots, intensifying towards the light source, lastly a little glaze of Gryphonne Sepia. The back just got a bit of highlighting with Titanium White and glazes of Prussian Blue and turquoise. I used a bit of turquoise on the front to show Verdigris and now this bit could be glued on as well. A last few touch ups, fresh black paint on the base and I can call this figure done! 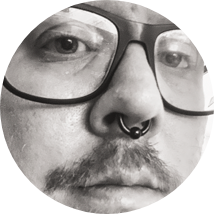 Thanks for reading, it was a long one, hopefully it can serve as inspiration and maybe drop of a nugget of gold here and there concerning techniques, colour choices and whatnot.